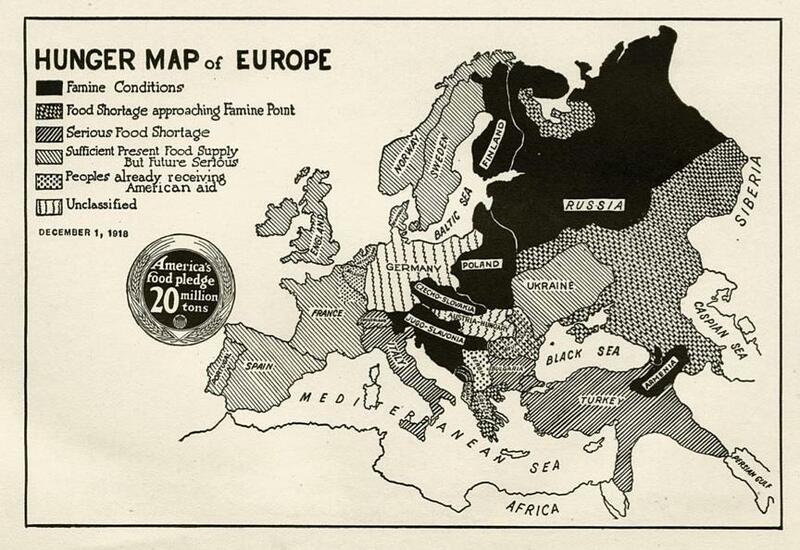 History of famine in Europe after WWI: A "hunger map" for American kids. From Food saving and sharing, telling how the older children of America may help save from famine their comrades in allied lands across the sea, prepared under the direction of the United States Food Administration, in cooperation with the United States Department of Agriculture and the Bureau of Education, published in 1918. Via the Human Ecology Collection, University of Wisconsin Digital Collections. The anonymous authors of this book looked to persuade children who might be relieved by the end of the war not to revert to their previous habits, arguing that much work was left to be done in Europe. Children might be enticed to help the still-hungry Allies by reminders about the causes of the food shortages in European countries. German villainy, now history, could still serve as persuasive force when it came to enlisting children’s help in rebuilding. “Everyone knows…how the German armies behaved after they had made their way into Belgium; how they murdered and tortured and looted and destroyed,” the authors wrote. “They were not unwilling that the Belgians should starve. The more that died the better; then the land would be free for them to occupy.” In France “the Germans set to work deliberately to do as much harm as possible,” destroying fruit trees and vineyards; they poisoned wells and burned houses. The authors also tried a little bit of shame, asking readers to think of a more disciplined diet as a sign of national maturity. The United States, as a “young country,” was greedy, the authors wrote. But this mania for a groaning table was unbecoming to a nation that was coming into its own on the world stage. Thanks to Shirley Wajda, curator of history at the Michigan State University Museum, for suggesting this item.